Leading Manufacturer of gsm highway emergency calling system, emergency telephone for highway, highway gsm sos (ecb-emergency calling system), sos system, gsm highway sos system and highway emergency call box from Nashik. 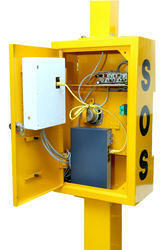 This GSM and GPS based Emergency Calling System (SOS) is Designed & Manufactured by Jyoti Telecom. It is used along with the national highways now a days. 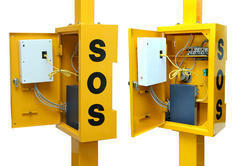 Users can push emergency call button placed on the SOS box, the call will be initiated to the control room. Same time sms send to the patrolling vehicles and ambulance too. Thus it is become helpful to the travelers on the road, as one can speak direct with the highway control rooms. The Unit works with Battery as well Solar Panel. Its working is continuously monitored by the service provider. Battery condition, solar status and GPS location is periodically send to server room by TCPIP on given IPNO. It helps to keep the system running 24x7. TCPIP, GPRS data send to the server. Emergency Telephone System for Highway is manufactured by Jyoti Telecom. This GSM based emergency calling system is used at Highways, Toll Plaza, and School during emergency incidents. The user can push emergency call button placed on the ECB System, the call will be initiated to the control room and authorize persons can receive the alert message on mobile phone. Thus it becomes helpful during the emergency. The Unit works with Battery as well Solar Panel. Its working is continuously monitored by Control Room. Battery condition, solar status is periodically send to server room by TCPIP on given IPNO. It helps to keep the system running 24x7. On National Highway (SOS), An Emergency Calling System, School/College Campus. 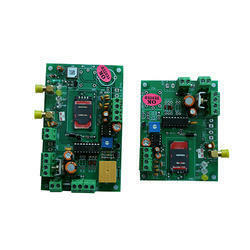 This GSM based emergency calling system is used at Highways, Toll Plaza, and School bus during emergency incidents. User can push emergency call button placed on the SOS System, the call will be initiated to the control room and authorize persons can receive alert message with address on mobile phone. Thus it become helpful during emergency occurs. Ø 5 No.Telephone Auto Dialer. Ø Industrial microchip technology with updated features. Ø College campus, crowded area. ü Inbuilt battery backup with battery low &cut indication. ü Control panel tampered switch. ü Solar Panel Removed alert. ü Industrial microchip technology with updated features. Applications:on National Highways an Emergency System, GSM-GPS application. 1. This GSM & GPS based emergency calling system is used at Highways during emergency incidents. 2. User can push emergency call button placed on the SOS box, the call will be initiated to the control room and authorize persons mobile phone. Same time location link send via GPS to 5 mobile nos. 3. Thus it become helpful for user. As one can speak direct with the control rooms if an emergency occurs. 1. CPU-CMOS flash base 8 bit microcontroller. · Induction by fugitive pressing on the Call Button. The Unit works with Battery as well Solar Panel. · Battery condition, solar status is periodically send to server room by TCPIP On given IPNO. It helps to keep the system running 24x7. Application: On National Highway, School/College Campus, Crowded Areas as Emergency Calling System. GSM Highway SOS System help you during emergency incidents occurs on National Highways. The system is well designed technically and with best quality material by Jyoti Telecom. Working:User can push Emergency Call Button placed on the ECB System, the call will be initiated to the control room and it is become helpful to the travelers on the road, as one can speak direct with the highway control rooms. CPU-CMOS flash base 8 Bit Microcontroller. 10 watt Audio Amplifier at 8¿¿¿ Speaker. Operating Temperature Range o to 55°C. Power Consumption 10mA in standby mode and 700mA during Call or SMS. Microphone Circuit with Surrounding Noise Filter. 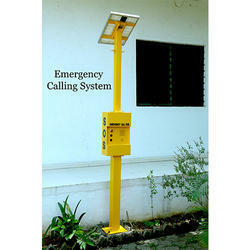 This GSM and GPS based Emergency Calling System (ECB) is Designed & Manufactured by Jyoti Telecom. It is used along with the national highways now a days. Users can push emergency call button placed on the SOS box, the call will be initiated to the control room. Same time SMS are send to the patrolling vehicles and ambulance too. Thus it is become helpful to the travelers on the road, as one can speak direct with the highway control rooms. The Unit works with Battery as well Solar Panel. Its working it is continuously monitored by service provider. 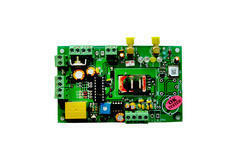 Battery condition, solar status and GPS location is periodically send to server room. · Inbuilt battery backup with battery low &cut indication. · Control panel tampered switch. · Solar Panel Removed alert. · 5 No.Telephone Auto Dialer. · Industrial microchip technology with updated features. Applications:on National Highways anEmergency System, GSM-GPS application. 5. Power consumption 30mA.in standby mode and 700mA during call or SMS.